There’s something special going on with the Boone County High School boys’ soccer program that’s not reflected in the varsity team’s 0-6 record. With players from 14 different nations on the roster, the Rebels are setting an example of acceptance and brotherhood that offsets the discord often found in today’s society. Boone County head coach Chris Norris said players born in foreign countries comprise a little less than 50 percent of his roster. Some of them came here to escape civil unrest in their native lands while others are seeking the education they need for a more promising future. There are players who were born in eight African countries — Egypt, Somalia, Senegal, Kenya, Nigeria, Morocco, Mauritania and People’s Republic of the Congo. The other nations represented on the roster are Burma, Jordan, Palestine, Brazil, Honduras and Mexico. Language barriers make it hard for Norris and his assistant coaches to instruct the foreign-born players during practice. The fact that most of them have never played soccer on an organized team before presents another challenge. The team’s other senior captain, Abdiaziz Jama, helps communicate the coach’s instructions. A native of Somalia who grew up in America, Jama speaks both Arabic and English so he serves as a translator for many of his teammates. 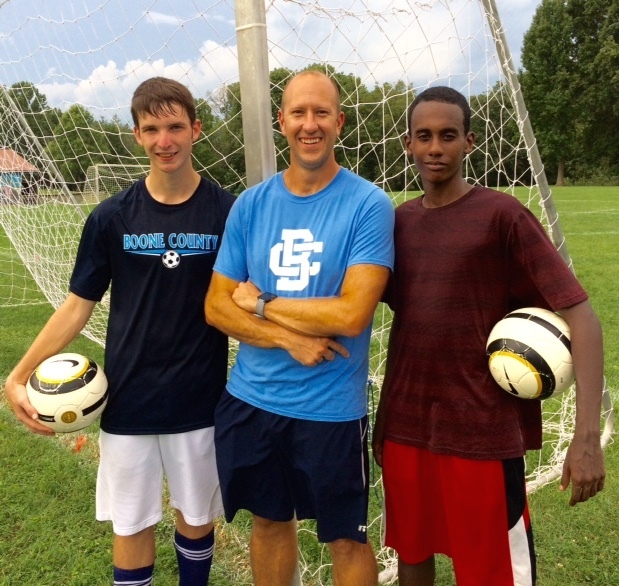 Jama actually recruited some of the foreign-born players enrolled at Boone County to join the soccer team, including his younger brother, Kadiye. The Rebels were outscored 33-3 in their first six games so the multi-national team still has a lot to learn. But the coaches have a hard time developing some of the foreign-born players because they took part-time jobs to support their families and can’t make it to every practice session or game. The coach has sensed some frustration caused by the team’s 0-6 start. Most of the foreign-born players don’t have the same skill level or experience as teammates who grew up playing club soccer and opponents are able to take advantage of that in matches. The cultural exchange between players is the reason it’s all been worthwhile, regardless of the team’s won-loss record. During the summer, players who grew up in the area had to pick up their foreign-born teammates and take them to practice. They undoubtedly learned a lot about each other during those car rides. Many of the foreign-born players are members of the Muslim faith and worship at a mosque in Florence. During the summer, they observed the holy ritual of Ramadan by fasting from dawn until dusk, but they still came to practice sessions. That helped Rice understand and respect the religious beliefs of his teammates, even though they are different from his own. My son is a senior on this team. I can’t say enough about their coaches & these boys. They truly love and accept each other. I know my son has learned a great deal about other cultures and is a better person because of this team. They may not have a winning record (as stated in the article for multiple reasons) but if you’re measuring in life lessons, these boys are champions.